Donald J. Trump was sworn in today as the 45th president of the United States. Photo courtesy of C-SPAN. The 45th U.S. president's speech was thin on policy and thick with rhetoric from the campaign trail, including his signature promise that he would "make America great again." Trump portrayed a nation with "mothers and children trapped in poverty in our inner cities," "rusted-out factories scattered like tombstones," and an education system that "leaves our young and beautiful students deprived of all knowledge." He decried "American carnage" caused by crime, gangs and drugs that have "stolen too many lives." And he promised a new era. "From this day forward, a new vision will govern our land," Trump said. "I will fight for you with every breath in my body — and I will never, ever let you down. America will start winning again, winning like never before." He vowed broadly to restore jobs and wealth, to "bring back our dreams," and to rebuild crumbling roads, highways and bridges. 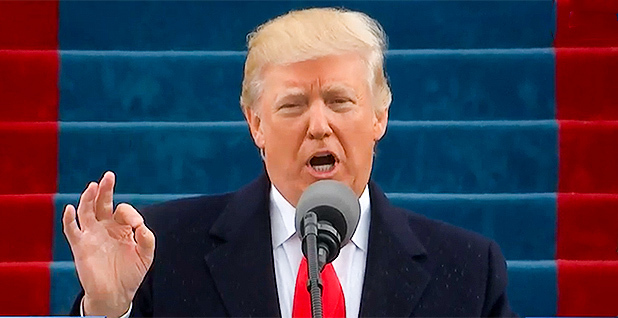 Trump was surrounded by his political friends and foes alike at the inauguration ceremonies, where he was sworn in by Supreme Court Chief Justice John Roberts. Former first lady and Trump's presidential opponent, Hillary Clinton, was in the crowd. She wrote today on Twitter, "I'm here today to honor our democracy & its enduring values. I will never stop believing in our country & its future." Although Trump didn't touch directly on energy or climate policy during his speech, his administration was quick to update the White House website with details of his "America First Energy Plan." 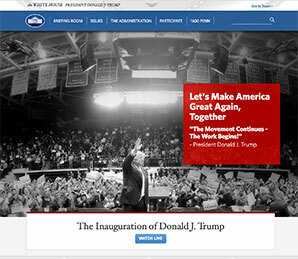 Trump's team updated the White House website minutes after the inauguration. The plan outlines the new administration's pledge to pursue energy policies that "lower costs" and "maximize the use of American resources, freeing us from dependence on foreign oil." Trump, the website says, is committed to slashing "harmful and unnecessary policies such as the Climate Action Plan and the Waters of the U.S. rule." The administration also pledges to "embrace the shale oil and gas revolution" and to revive "America's coal industry, which has been hurting for too long." Those energy policies, the website says, will go "hand-in-hand with responsible stewardship of the environment." Trump will "refocus the EPA on its essential mission of protecting our air and water," it says. Environmentalists quickly pounced on the new administration and the White House energy plan. "President Trump wasted no time siding with Big Polluters. Sad!" said Tiernan Sittenfeld of the League of Conservation Voters in a statement. "The new administration's energy plan should actually be called 'Big Polluters First,'" she added. "This is a disgraceful way for Trump to begin his presidency, and LCV is ready to go to the mat to defend both bedrock environmental protections and recent progress." Sierra Club Executive Director Michael Brune said, "This president clearly has no mandate. If and when he and his administration try to undermine climate action, assault our democracy, or attack the people and places we love, he will face a wall of organized people who will fight him in the courts, in Congress, in the marketplace, in the states, and in the streets." And Friends of the Earth President Erich Pica called Trump "a compulsive liar and a bully" whose presidency "is going to test the very foundations of our democracy." Pica added, "Friends of the Earth will remain vigilant and fight every attack on the laws that have protected our water, air, food supply and democracy."